While specialist theologians regard Archbishop Rowan Williams as a creative and powerful thinker, others often find him complex and difficult to follow. I shall never forget sitting in the sunshine on a summer afternoon in the beautiful Cathedral Close in Exeter in 2009, when the diocese was celebrating the 1100th anniversary of its foundation, listening to Rowan being interviewed by David Winter. The Archbishop simply told the story of his conversion to Christ and subsequent spiritual journey – everyone in Exeter on that sunny afternoon could understand everything he said – it was simple and moving. And in his book Christ on Trial (2003) Rowan Williams explains that the gospel is not an abstract mantra, but an invitation “to be drawn into cross and resurrection and to find there … at once a decisive No and an everlasting Yes to ourselves”. 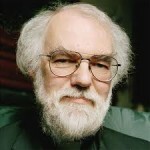 The theme of this website is pilgrimage and, in a series of occasional blogs, I want to try to demonstrate that Rowan Williams can actually be understood and that he has valuable and engaging insights for believers across the church spectrum and for unbelieving searchers after reality as well.